Apple's most advanced operating system for Mac i.e. OS X El Capitan 10.11.1 (Build: 15B42) and OS X Server 5.0.15 (Build: 15S4033) final and full version has been officially released. The all new Safari 9.0.1 for OS X 10.11+ (El Capitan), OS X 10.10.5+ (Yosemite), OS X 10.9.5+ (Mavericks), Keynote 6.6, Pages 5.6, Numbers 3.6, iWork (iOS 2.6) for OS X Yosemite v10.10.4+ or latest and iOS 8.4+ or newer updates has also been released. Mac users can Free upgrade and install all latest available software updates using iTunes. The official Direct Download Links of OS X El Capitan 10.11.1 Setup / Combo Update Final .DMG Files are also available. What's New in OS X 10.11.1 Changelog? The latest OS X El Capitan v10.11.1 update features stability, security, compatibility and bug fixes for Mac. You can read full changes in image below! What's New in OS X Server 5.0.15 Changelog? 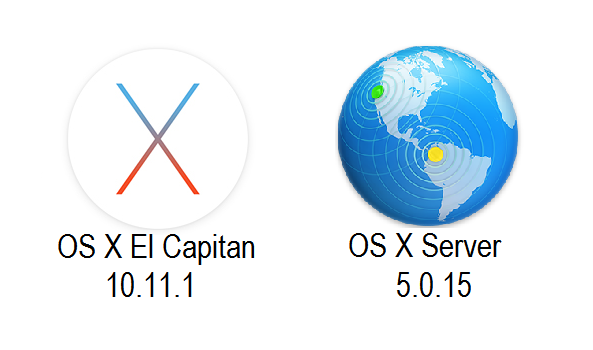 The newest OS X Server v5.0.15 update includes improvements and enhancements. More you can find in below image! How to Manually Install OS X 10.11.1 Update? If you're running any old Mac OS X operating system versions, then just navigate to Mac App Store >> Software Update option to download and install latest available updates. Mac OS X 10.10.1 El Capitan is compatible with OS X Snow Leopard 10.6.8+ or any latest Mac operating system, and it's also available in multiple languages i.e. English, Arabic, Catalan, Chinese, Croatian, Czech, Danish, Dutch, Finnish, French, German, Greek, Hebrew, Hungarian, Indonesian, Italian, Japanese, Korean, Malay, Norwegian, Polish, Portuguese, Romanian, Russian, Slovak, Spanish, Swedish, Thai, Turkish, Ukrainian, and Vietnamese. Whereas, Mac OS X 5.0.15 Server is supported by OS X Yosemite 10.10.5+ or any newest Mac OS X version, and it's available in different languages i.e. English, Chinese, Dutch, French, German, Italian, Japanese, Korean, and Spanish. Mac OS X users can install OS X El Capitan 10.11.1 with Bootable USB or DVD using iTunes for Free. Just Download OS X 10.11.1 El Capitan Setup / Combo Update .DMG Files via Direct Links. Click Here for official Apple guidelines.